I am slowly recovering from the recent round of grant writing. The internal deadline for our Australian Research Council (ARC) Discovery Projects (DPs) was on Monday, and, as ever, it was late nights and early mornings to put together the 115 pages of science case, budgets, budget justifications, publication records, career histories etc etc etc. Now all I have to do is sit back until July (when the referees' reports come in) and then to November (when the results are announced). If I get my grant, I'll write and say how great the systems is. However, if I am the three in four who will not get funded, I'll have a rant. 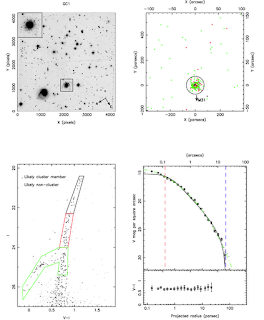 Anyway, even though the days have been lost to grant writing, science has advanced, and we recently had a paper accepted for publication in MNRAS, using the Hubble Space Telescope to look at clusters around our nearest big galactic neighbour, Andromeda. Not everything that can be counted counts, and not everything that counts can be counted.Albert Einstein, (attributed) I don't know how widely it is known outside academic circles, but researchers these days are surveyed and counted continuously, in an effort to show that tax-payers money is being spent on research excellence and research impact. A number of countries have held such exercises, and here we are into the second round of the Excellence in Research for Australia. Such exercises have real impact, as some at The University of Sydney just found out; those not producing enough "research outputs" are in the firing-line for redundancies. With the growth of online databases of papers and citations, it's now easy to get an assessment of someones research output, and with things like Google Scholar it's all nicely displayed; here's mine. 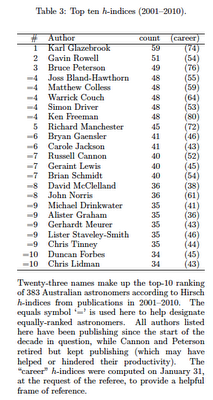 People's careers get wrapped into a few metric, and the principle one is the h-index. Back in Oz after a week in the US at the University of California at Santa Barbara (UCSB). I was at a conference called First Galaxies and Faint Dwarfs at the Kavli Institute of Theoretical Physics. The week started with us being told that this was going to be the best conference we would ever attend, and I must agree that it was. Instead of the usual barrage of 15min talks, we had 40mins of review talks, with discussion sessions, and it was great. Essentially, the goal was to bring together two communities, those that study the high redshift universe and the first forming galaxies, and those that look at the tiny dwarf galaxies in our local universe. Why? Because understanding galaxy formation and the links between the nearby and faraway will reveal the inner workings of the universe, especially the nature of dark matter. 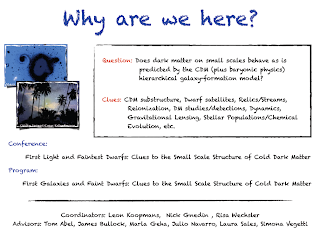 A quick post this evening, as I have been at a workshop for the SAMI instrument, and am off to Santa Barbara for the First Galaxies and Faint Dwarfs: First Galaxies and Faint Dwarfs conference next week, but a couple of things to post. The first is a paper by my ex-phd student, Juliana Kwan, who is now a postdoc in the US at the Argonne National Laboratory. Our Milky Way galaxy is just a little dot in there. But the detail of the way the mass is distributed is a probe of our Universe, as its present structure carries the imprint of the forces that created it, including the make up of the Universe, the cosmic evolution, and even the nature of gravity itself. Now, I love a good comedy (and a few bad ones) as much as the next person, but it's grant writing time, and so I am going to be grumpy here. One thing that gets me hot under the collar is terrible portrayals of science, especially astronomy and astrophysics, in the media. Which brings me to exhibit number 1. The TV comedy, Supernova, starring welsh comedian, Rob Brydon. The story is simple. Brydon plays Dr Paul Hamilton, who moves to work at the fictional Royal Australian Observatory, and the laughs come thick and fast in the usual "fish out of water" situations. Well, they don't really, the series was a flop, and lacks a lot of laughs, but, amazingly, a second season was made. I don't know how I missed this when it was originally shown in 2005/2006, but its portrayal of astronomy and astronomers is, well, rubbish. I would write pages and pages on this, but let's start with some basic things. What's the goal of astronomy and astrophysics? Pretty Hubble pictures? Whacky statements about multi-verses and black hole entropy? Nope, not really. The goal is to understand the Universe in terms of the laws of physics. Like "real" science, there is a strong link between theory and observation and experimentation, each feeding off each other, and as I noted a little while ago, the development of new instrumentation on telescopes often opens a new window on the Universe. Instruments like SAMI will let us do something new, namely measure the spins and chemistry of a large number of objects. But now the key question - If you were going to measure the spins of a whole load of galaxies, what would you expect to see? Would they be randomly orientated? Would patches of galaxies spin together in unison? Would nearby galaxies spin in opposite directions? And how would you even begin to answer this question?